If you can get addicted to a shampoo and conditioner, then I am well and truly addicted to the Fudge Big Bold OOMF range! 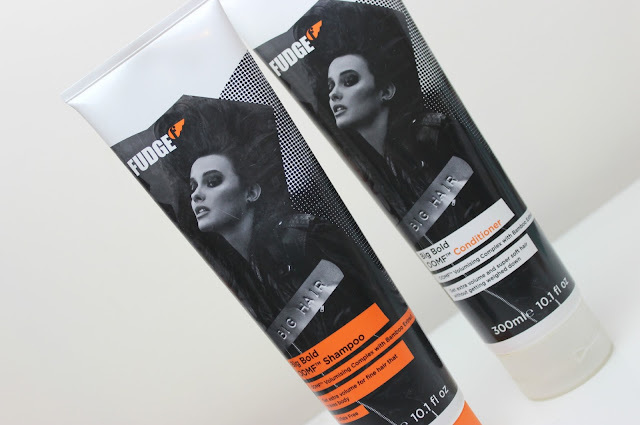 I was first introduced to Fudge back when I was 18/19 and in college training to be a hair stylist. I was really drawn to their styling products because not only did they work really well to effortlessly style all types of hair, but Fudge products have an amazing signature scent to their products of delicious fudge! Until recently I had never tried anything other than styling products from Fudge, so I was really intrigued to see how a shampoo and conditioner would fair from a brand I already knew well and loved. The Big Bold OOMF Shampoo and Conditioner work to give hair extra life and volume. A dual volumising system, they've been formulated to pump up hair, providing extra body and bounce. The shampoo cleanses hair, removing excess oil from hair and scalp, whilst the conditioner works to leave hair feeling softer and smoother. The shampoo has just the right consistency; as I have fine hair, I find heavy shampoos hard to work with, whereas this one is just right and works really well to cleanse my hair whilst creating a gentle lather. The conditioner is a touch thicker than the shampoo and for me works best when applied to mid-lengths and ends. Both the shampoo and conditioner smell absolutely amazing, a scent that lingers for a couple of hours after washing too. When I use the Big Bold OOMF shampoo and conditioner my hair is left feeling softer, easier to style and with a subtle lift at the roots. That said, it's not the most volumising shampoo and conditioner I've tried before! Both the shampoo and conditioner are available individually, costing £7.62 for 300ml. They are also available as a super budget-friendly duo, buying both the shampoo and conditioner together in a set, for just £10.50 - a saving of £4.74!